NAVBLUE have designed RNP AR departure procedures for Vágar Airport (IATA: FAE, ICAO: EKVG) to allow for improved operations for its airline operators, to ensure airport arrivals and departures are more efficient for passengers. The project follows on from recent work to introduce RNP AR APCH procedures for public use, published in the Danish AIP earlier this year. There are no common design criteria procedures for RNP AR departures currently in existence. NAVBLUE have developed these criteria and work with regulators and authorities world-wide to ensure they are accepted. RNP AR procedures mean airline operators still need dedicated approvals from authorities and NAVBLUE supports diverse stakeholders, such as the Danish Transport Authority throughout the entire approval process to achieve this. The implementation of RNP AR departures allows for the reduction of workload for the crew, a definition of fully managed procedures, predictable and repeatable trajectories which together contribute to enhanced safety. It allows for the reduction of lateral protection areas to let a corridor be threaded through challenging terrain to reduce the angle of ascent. This reduced thrust on take-off allows for more passengers or optimized fuel consumption. “The operational environment at Vágar can be challenging so we want to give operators every advantage possible so that they can get the best from their aircraft.” says Jákup Egholm Hansen, COO and Airport Manager of FAE Vága Floghavn. 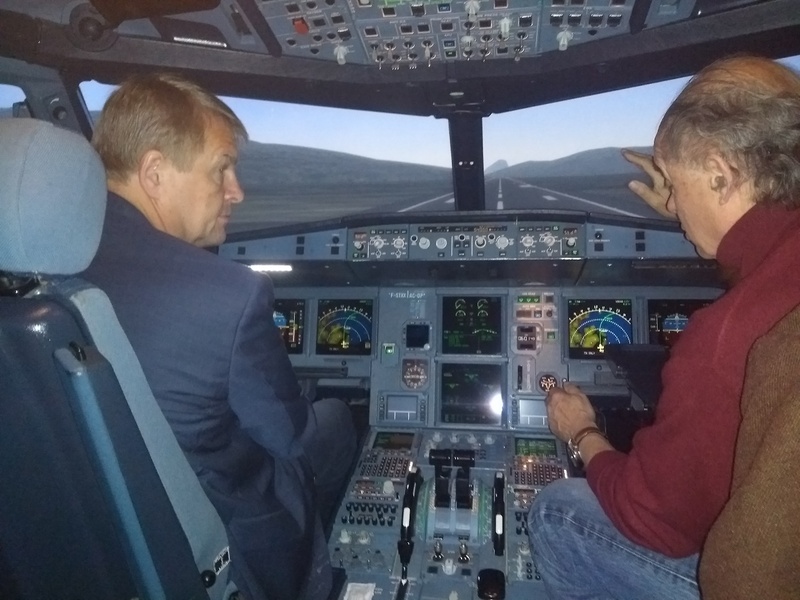 NAVBLUE technical pilot Etienne Tarnowski with Vágar Airport COO Jákup Egholm Hansen during a Full Flight Simulator session demonstrating the new RNP AR depature procédures. NAVBLUE is an integrated Flight Operations and Air Traffic Management Services company providing end-to-end, innovative and integrated flight operations solutions for a wide-range of customers around the world.